China’s industrialized economy is transforming itself from one heavily reliant on coal and steel production to a greener one that uses less energy. But as studies trickle in painting a picture of what that means for the climate, there is a lot of uncertainty about when China’s carbon dioxide emissions will reach their peak. A team of London scientists thinks it may have an answer: China, the world’s largest greenhouse gas polluter, will use less and less energy over the next decade, leading to a peak in the country’s emissions sometime between now and 2025. But in a twist, the same researchers say there’s a chance that China’s emissions may have peaked already because of a significant drop in coal consumption last year. If so, the country may have met its target to max out its carbon emissions nearly 15 years sooner than it expected, according to a study published this week in the journal Climate Policy. Study lead author Fergus Green, a climate policy consultant at the London School of Economics and Political Science, said China’s decline in coal consumption in 2015 was so significant that the related decline in carbon dioxide emissions from coal outweighed the growth in carbon emissions from oil and gas use, which continued to grow last year. For 2014 not to have been the peak, emissions would need to grow over the next decade by more than they fell in 2015, he said. Chinese officials, however, are standing by their country’s intitial projections. They said this week that the country’s carbon dioxide emissions are still increasing because it is still industrializing, and they expect emissions there to hit their apogee sometime around 2030. The years between 2000 and 2013 were boom times for China, with high levels of energy-intensive industrial growth leading to a spike in its coal consumption and steel production, and rising greenhouse gas emissions along with them. During that time, the country’s energy consumption grew 8 percent annually. But as its economic growth has slowed since 2013, its energy consumption has fallen to a growth rate of less than 2 percent each year, reducing the need to burn as much coal. At the same time, China has been investing heavily in low-carbon renewable electricity and has seen its highly-polluting steel and cement industries tumble. The country has also begun aiming to curb its carbon emissions to clear the air in its notoriously polluted cities. All those factors led to a 5 percent drop in coal consumption and a 35 percent fall in coal imports in 2015. Emissions sources in Chongqing, China. 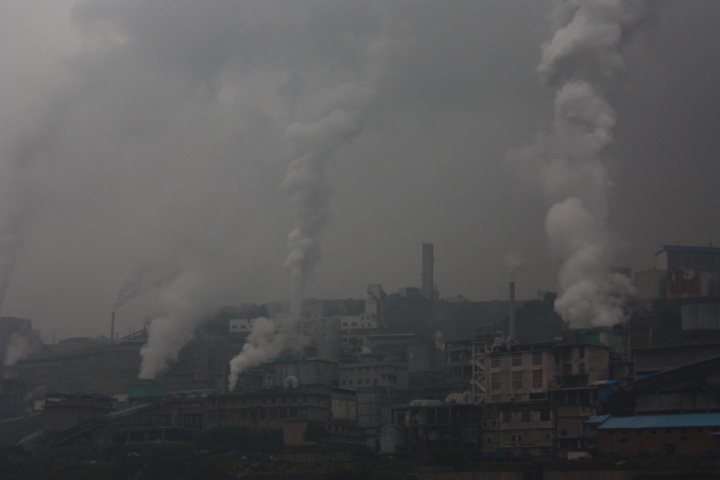 Glen Peters, a global carbon cycle researcher at the Center for International Climate and Environmental Research in Oslo, Norway, said he agrees that China’s emissions have yet to peak, but China’s complex economy is unpredictable enough that it’s hard to forecast when its carbon emissions will reach their apex. Other scientists say the research by Green’s team shows that China is pushing ahead with its commitment to reduce its greenhouse gas emissions to benefit the climate. Ranping Song, of the World Resources Institute’s Climate Action Program, said there are a lot of uncertainties about the future of China’s economy, and it’s too early to say if China will meet its 2030 emissions pledge as part of the Paris climate agreement. “To me, the focus should not be on when China would be peaking (its emissions) but if China is actually laying the foundation to reduce emissions over the long term,” by developing renewables and reducing the carbon intensity of its economy, Song said. Rob Jackson, a Stanford University earth systems science professor, said the new study shows that China’s carbon-intensive boom days are over. Jackson published research last year showing China’s emissions growth rate is declining even as its economy grows. “We’ll probably see modest (emissions) growth of 1 to 2 percent in some years over the next decade, but I expect Chinese emissions to peak well before the government deadline of 2030,” Jackson said.